The direct action group demanded change as the Health Protection Surveillance Centre's annual report revealed the reality of HIV in Ireland. Health & Science 26 November, 2018 . Written by Sarah McKenna Barry. The HPSC released its annual report on HIV in Ireland on Friday, and with recent data indicating that new diagnoses have reached historic highs, ACT UP Dublin have called for a series of measures in light of the HIV crisis. 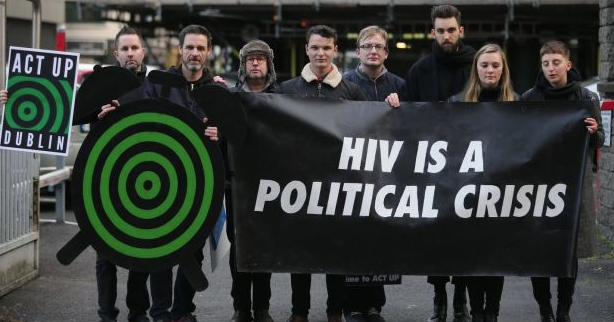 ACT UP highlighted how, at around 500 per year, HIV diagnoses in Ireland have remained “stubbornly high”, and at a rate that is “significantly higher than the EU average”. ACT UP signalled the work done by KnowNow, a group who provide free, rapid HIV testing, and called for similar programmes to be developed to “reach other groups, including, especially migrants”. “We need better communication between clinics, and more effective measures to sustain care and engagement with services. Proper health services should be provided along with HIV care. 26 November, 2018 . Written by Sarah McKenna Barry.